During the past 10 years Azerbaijan government had achieved the significant progress in the direction of these goals. According to analyzes carried out these achievements based on a number of important factors. It includes provision of domestic stability in Azerbaijan and having the long termed nature, successes gained in the economy and so increasing the economic power of the country, so elimination of foreign dependence entirely, basing by the head of state, the person that define the foreign policy course, on the protection of the national interests and profits, and finally strengthening a professional approach in foreign policy. As a result of the correct foreign policy both the fact of turning of Azerbaijan as the region’s leading state became a reality and the foundation of new energy projects, the transport infrastructure, which is of great importance for the region, European and Asian continents was laid. During the past 10 years, one of the most important achievements of Azerbaijan\'s foreign policy may be shown as the Baku-Tbilisi-Kars railway project. In accordance with the strategic course chosen by Azerbaijan the negotiations on this project started on July 26-29, 1993,at the meeting of the Joint Commission on transportation between Turkey and Georgia held in Ankara. Later, negotiations on the project stopped. On July 20-21, 2002, at meeting of the Turkish-Georgian transport ministers held in Istanbul, Turkey in the protocol signed on the implementation of the Kars-Akhalkalaki railway project, it was decided to start the preparatory work on the project, but no progress on implementation of this project has not been made. Finally, Azerbaijan increased diplomatic efforts for realization of the strategic importance of this project and it has become one of the main priorities of regional policy. 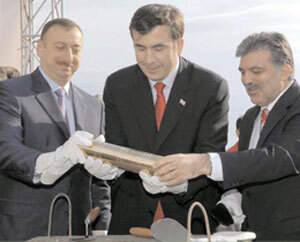 On June 14, 2004 at a joint press conference held in Tbilisi, Georgian between President of Georgia Mikhail Saakashvili and Azerbaijani President Ilham Aliyev, the latter had supported the importance of realization of the railway project via Turkey and expressed the readiness of Azerbaijan to participate in this project. On August 02-05, 2004 at meeting in Ankara, Turkey devoted to development of Azerbaijan- Turkish transport links and the negotiations on new railway project of Baku-Tbilisi-Kars railway transport, the parties, first of all, agreed to carry out engineering-research works and preparation of adaptation projects. On December 28, 2004 the next meeting related to the project was held and the Joint Working Group was created. Finally, on May 25, 2005 in Baku, Presidents of the Republic of Turkey, Azerbaijan, and Georgia signed the joint declaration on the acceleration of the implementation of the Baku-Tbilisi-Kars railway link project. The importance of this project in which Azerbaijan is the leading country is not related just to economy and those much concerned about its association with the geopolitical character did not spend a time in vain. Armenian lobby in Western countries and Armenia had made a noise about the fact that Armenia would be further isolated from the region and so made efforts to prevent its realization. As a result of the efforts of the Armenian lobby the U.S. Exim Bank of the United States put a ban on credit allocation for the construction of the Baku-Tbilisi-Kars railway. However, Azerbaijan making a quite a bold political move had granted to Georgia a low-interest loan to finance the project. Thus, efforts aimed at blocking the project met with fiasco. On February 7, 2007, at meeting held in Tbilisi, the President of the Republic of Azerbaijan Ilham Aliyev, Georgia\'s President Mikhail Saakashvili and Turkish Prime Minister Recep Tayyip Erdogan signed an agreement on the implementation of the project. As a link increasing the importance of the transport corridor Europe-Caucasus-Asia (TRACECA) the implementation of this project will strengthen the position of Azerbaijan in the region, and strengthen its status as an important transit country. In the past 10 years, the cooperation of Azerbaijan with the European Union (EU) went beyond the scope of country\'s security needs, and expanded in the economic, political and social spheres. 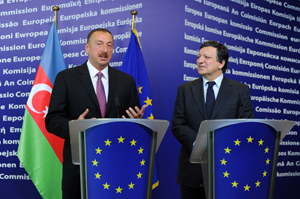 In 2006, within the framework of European Neighborhood Policy, EU-Azerbaijan Action Plan was adopted, the plan strengthens the political dialogue between the EU and Azerbaijan, develops cooperation in the political, economic and institutional reforms fields and lay the foundation for qualitatively new level of development of cooperation. Implementation of EU-Azerbaijan Action Plan will serve to further strengthening mutual political and economic dependence between the EU and Azerbaijan. 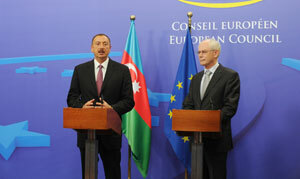 Later, Azerbaijan became one of the leading countries joined the EU Eastern Partnership Initiative. Azerbaijan\'s strategic importance in terms of ensuring energy security of Europe, being the region’s leading state had further increased the specific weight of the partnership with the EU. The importance of Azerbaijan successfully implementing regional infrastructure projects such as the Baku-Tbilisi-Ceyhan oil pipeline and South Caucasus gas pipeline further increased for Europe, and it contributed to European and global energy security and laid the foundation for the vital and new energy sources for Europe. Not only as an energy producer and exporter at the same time as the central player in the region as an important transit country and an important actor in the international arena Azerbaijan’ s opportunities are increasing. Azerbaijan achieved the important results not only in the relations with Europe but with the United States, the leading power of the world and since early years in 2000, after the September 11 terrorist attacks this strategic partnership is expanding. Thus, Azerbaijan remained one of the most important partners in the global fight against terrorism by the United States. It supported international peacekeeping operations in Afghanistan and Iraq. Azerbaijan\'s peacekeeping forces in Iraq in 2008, has successfully completed its five-year military service along with the U.S. Navy. The United States consider Azerbaijan as strategic partner located the crossroads of the Middle East, Europe and Asia, where American interests and foreign policy in the region is determined. The critical situation in the South Caucasus region (5-day war in August) in August 2008, of course, was a serious test for Azerbaijan\'s foreign policy. But at that time due to success of Azerbaijan\'s foreign policy strategy with balanced approach based on national interests allowed the country to pass this successfully this test, and this policy justified itself. At that time, when a sudden military conflict arose between Russia and Georgia, Azerbaijan had to make a critical choice. Thus, Azerbaijan had to maintain the strategic relations with power like Russia and not to leave its strategic ally of Georgia alone. At that critical 5-day war Azerbaijan using the partnership relations between with Russia succeeded in ensuring the security of the strategically important oil terminals and Azerbaijani oil and gas supplies to the territory of Georgia. On the other hand Azerbaijan demonstrated its support to Georgia as much as possible. Because the protection of Georgia\'s independence and sovereignty were vital to the interests of Azerbaijan in the region. Finally, in April 2009, when the country\'s closest strategic ally, brother country Turkey was going to establish relations with Armenia without solution of Nagorno-Karabakh conflict, opening the borders with Armenia Azerbaijan\'s foreign policy face the next serious examination. This step of the closest ally of Azerbaijan accompanied by a wide range of objections of communities in two countries. On that eve the diplomatic contacts in the region has been intensified, Azerbaijan was under strong pressure from all sides in order not to prevent to normalize relations between Turkey and Armenia in view of settlement of Garabagh conflict. The text of protocols between Turkey and Armenia was completed and agreed and in Istanbul on April 7, 2009, at the Alliance of Civilizations forum its verification should take place with participation of the U.S. President, Secretary of State. President of Azerbaijan was also invited to that forum. U.S. President Barack Obama, Secretary of State Hillary Clinton, as well Turkish leaders called to President Ilham Aliyev to participate in this forum and at ceremony of verification of protocols. However, Azerbaijan could not give support to this initiative putting its national interests under the threat and President refused to go to Istanbul and instead called the meeting of the Security Council of the Azerbaijan in Baku. At that meeting, the President made the following statement: Our country never interfered, is interfering and will interfere in the internal affairs of other countries in future and we have no such intention. At the same time, Azerbaijan never interfered in bilateral relations between other countries and will never interfere in future. At the same time we have a natural right to carry out our policy according to the situation that may arise or will arise in the region, and we will exercise this right in any form. Namely equal partnership strategy based on mutual interests of all countries having interests in the region has allowed Azerbaijan to prevent the implementation of the initiative against its national interests by having the successful maneuvers in its foreign policy at that critical situation. Thus, although Turkish-Armenian protocols were signed but its implementation did not happen, Turkey had shown a firm stance not to take any steps against the interests of Azerbaijan. It was once again confirmed that Azerbaijan is the leading state of the region and without its consent, its participation no one initiative can be implemented in the region. One of the main achievements of the foreign policy of Azerbaijan pursued during the past 10 years was election of our country as non-permanent member of the world\'s most influential organizations in the UN Security Council last year with the majority of votes. This result was gained due to carrying out an active foreign policy by Azerbaijan; increase the number of times of foreign diplomatic missions, formation of successful bilateral relations in more new countries in spite of their remoteness from geographical point of view, and finally intensive work within the framework of the UN General Assembly, effective lobbying and numerous foreign trips. As a result, on October 25, 2011 for the first time in the history of Azerbaijan, it was elected a member of the UN Security Council. The voting process was quite intense, held under the sharp competition conditions, and finally the rival of Azerbaijan - Slovenia back understood that it could not gain enough votes and withdrew its candidacy. 155 countries voted in favor of Azerbaijan at the voting held later and 24 countries remained neutral. The support of Azerbaijan by world\'s 155 countries in this voting was recognized by everyone as a great diplomatic success. 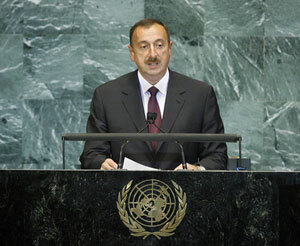 This vote put forward the fact that Azerbaijan is not only important country for the region but also for the world. Later it became clear that Armenia also desired to be elected to the United Nations Security Council but as it saw that there was no chance for it, so withdrew its candidacy. Thus, in the past 10 years, the successes made in the foreign policy of Azerbaijan strengthened its position in the region and the world. Azerbaijan is considered as reliable and a stable partner either in the regional and global security or in provision of energy security. Success of Azerbaijan\'s foreign policy creates conditions that large investments are made by us in many foreign countries, thus, becoming the respected player in the world, and strengthen its reputation further. Beginning in the mid of 2000 Azerbaijan started to implement the strategy of continued increase of the number of its diplomatic missions. The increase in economic power of the country enabled the government of Azerbaijan to establish its embassies in more countries. In recent years, particularly since 2004, the embassies of Azerbaijan in foreign countries during the last period, the number of the diplomatic corps has been increased about 3 times. At present, Azerbaijan has 71 diplomatic representations abroad, as well as 5 representatives at international organizations, 8 consulates, embassies’ representation in 2 countries and 3 honorary consulates. The geographical location of Azerbaijani embassies significantly expanded all over the world except Australia and covered all continents. Embassies were opened in countries far away as Argentina, Paraguay, Thailand, and Sri Lanka. 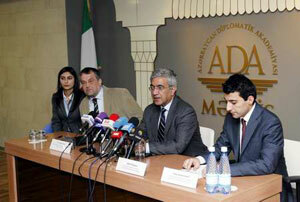 It is planned to increase the number of diplomatic missions of Azerbaijan abroad. In addition to increasing the number of foreign diplomatic missions the necessity to provide them with professional staff appeared. Pursuant to this necessity, in March 2006 the Azerbaijan Diplomatic Academy of Azerbaijan established under the Ministry of Foreign Affairs for diplomatic personnel training. For more dynamic form of foreign policy, to strengthen the coordination between agencies, carrying out this policy the consultation of heads of diplomatic service agencies of the Republic of Azerbaijan in Baku became a tradition. Up to now there were several such meetings. The first such meeting was held on July 27, 2004. President of Azerbaijan Ilham Aliyev having the speech in front of ambassadors at that meeting demanded from them to carry out the “offensive diplomacy” in order to deliver to the international community the truth on the Nagorno-Karabakh conflict. It is no coincidence that thanks to the offensive diplomacy the Armenian lobby, which carried out information war against Azerbaijan for many years, had to change the tactics in recent years and choose the defending tactics. Now the leaders of Armenia confess that Azerbaijan is in more powerful position in information, propaganda diplomacy. Strengthening mutual cooperation of diplomatic representations of Azerbaijan with our Diaspora organizations abroad was put as an aim, thanks to it the situation has changed significantly positive in the direction of delivering the realities of Azerbaijan to the international community.